Mumbai: Adamning report containing new allegations of human rights abuses in Zimbabwe’s diamond fields has cast further doubt on the clearance of exports of “Zimba diamonds", as they are known in the trade, at a time when India’s diamantaires are more eager than ever for raw diamonds from the African nation. The report, a BBC investigation, was released on Monday and alleges that the Zimbabwe government runs a “torture camp" in the Marange diamond fields, in which “severe beatings and sexual assault" are commonplace. The Kimberley Process (KP), the body charged with banning the trade in so-called “blood diamonds", currently blocks diamond exports from Zimbabwe. When the Marange diamond fields in eastern Zimbabwe were discovered in 2006, they were regarded as the biggest diamond find in more than a century. Besides being a bonanza for Zimbabwe, the find was also viewed as a boon for India, where it is estimated that 10 out of 11 of the world’s diamonds are cut and polished. The BBC report will likely complicate matters. Gem and Jewellery Export Promotion Council (GJEPC) executive director Sabyasachi Ray, who represents the industry in India’s delegation to the KP, declined to comment on how the BBC report will affect the ongoing negotiations, but said that the findings did not jibe with what he has seen during his visit to the Marange fields. He called the report “baffling". Ashit Mehta, chairman of the Surat-based Blue Star Diamonds, said that rough diamond prices have gone up an average of 40% since Diwali, which is the traditional start of the trading year, and that the prices of small stones like the ones mined in Zimbabwe have increased by up to 120%. This, he said, comes on the heels of 30 years of stable diamond prices undermined by increased demand for diamonds from the Indian market. Likewise, the South African diamond firm De Beers Diamond Jewellers Ltd, reported that the price of rough diamonds grew by 33% in the first half of 2011, “buoyed by continued retail demand from the Indian and Chinese consumer markets". And 2010 saw wholesale prices of polished diamonds in India grow by 25%, De Beers reported. “There have been no new (mine) discoveries and existing mines are wearing out," Mehta said. “Zimbabwe diamonds are 40-50% cheaper than diamonds from other sources," he said. And while Zimbabwe diamonds are suited for industrial uses, Surat processors alone have the expertise to polish them into gemstones, he added. Before the BBC report, however, insiders saw progress in the negotiations. “There is (still) no consensus in the KP that exports from Marange can be allowed," said Nadim Kara of the Ottawa-based NGO Partnership Africa Canada, who has been present for much of the negotiations. “Most of the major parties have now accepted that: the US, Canada, the EU and now India, the UAE and Israel have all said that too. This is an important development because though India wants exports to be allowed, it shows a new solidarity within the KP, which is a quite positive development." However, Kara said, the new allegations of human rights abuses, have “emerged at exactly the right time to stiffen the resolve of those countries who know that unacceptable levels of violence are plaguing the Marange diamond fields, but who have not had access to credible intelligence about that violence." The long delay, participants say, is due to the politicization of the KP and indeed a crisis of confidence within the monitoring body itself, brought on by the Zimbabwe issue, its first real test. Critics say Zimbabwe’s diamonds do not fall under the accepted definition of “blood diamonds" and thus should be legal, whatever the human rights ramifications. India has been one of the most vociferous advocates of the export of Zimbabwe diamonds. “As the world’s largest diamond cutting centre and as the world’s only centre that has the capacity to process all ranges of Marange goods, it is clear that the politicization of the KPCS has impacted India more than any other country," Chaim Even-Zohar, of the Israel-based influential diamond consultancy Tacy, said an email. The Kimberley Process Certification Scheme, or KPCS, was formed in 2003 in response to an outcry over “blood diamonds", which it defines as “rough diamonds used by rebel movements or their allies to finance armed conflicts aimed at undermining legitimate governments". It is named for South Africa’s storied Kimberley diamond fields, near which the scheme was conceived. The NGO Global Witness, an early advocate of the KP, describes it as “an import-export certification scheme, which requires participating governments to certify the origin of rough diamonds, and put in place effective controls to prevent conflict stones from entering the supply chain". The 75 participating countries must also enact domestic legislation to enforce the scheme’s provisions and can only trade diamonds with other KP members. The problems for Zimbabwe date back to 2008, when human rights groups reported widespread human rights abuses in the Marange fields. 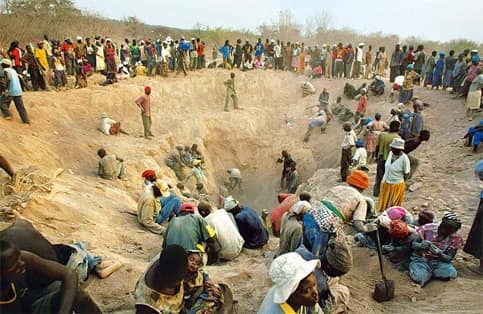 Human Rights Watch has reported persistent cases of “soldiers in Marange…engaging in forced labour, torture, beatings, and harassment" of diamond miners". Speaking at an industry conference in Mumbai last October, Zimbabwe’s minister of mines Obert Mpofu called the allegations against his country lies “cooked for political convenience". He said Zimbabwe’s competitors want to keep Marange diamonds off the market for fears that they will drive down the price of rough diamonds, adding that Zimbabwe diamonds are already “everywhere", including in Surat. The GJEPC’s Ray concedes that the ban on Zimbabwe diamonds has led to smuggling. “We know that if there is an embargo, smuggling will happen," he said. After the conference, Mpofu closed a deal with Surat Rough Diamond Sourcing (India) Ltd (SRDSIL), a 1,500 member consortium of diamond cutters and processors, in which $1.2 billion (Rs 5,424 crore) worth of rough diamonds will be purchased by the consortium, in return for which Zimbabwean diamond cutters will be trained in Surat. Blue Star’s Ashit Mehta, who is also the chairman of the SRDSIL, said the deal is still valid, pending KP approval of Zimbabwe exports. What makes the issue contentious is that the alleged human rights abuses in Zimbabwe were said to be perpetrated not by a rebel group, but by the Robert Mugabe government itself. Thus began an ongoing debate on whether the Kimberley Process’ mandate should be expanded to stem a broader spectrum of human rights abuses. GJPEC’s Sabyasachi Ray says India endorses a narrower mandate. “Human rights is dealt with by the NHRC (National Human Rights Commission) also by the human rights body in the UN (UN High Commissioner for Human Rights or UNHCHR). The issue is whether the KP has the power to deal with every kind of human rights, which a lot of countries are not very comfortable with. They do not believe that the KP has adequate expertise to deal with these issues," he said. “Let us not try to expand the KP beyond what it was created for." Speaking at a press conference in Mumbai on Wednesday, leading diamond expert Martin Rapaport, chairman on the US-based Rapaport Group, said the KP was not designed to stop human rights abuses. “The Kimberley Process was created by governments for governments to protect governments," he said. “That the KP stops human rights abuses is a big lie. It stops people from finding legitimate solutions. It’s time for the diamond industry to stop lying about the Kimberley Process. The KP will cure AIDS before it ends human rights abuses," he said. In the wake of the events of 2008, KP members agreed on a 15-point “joint work plan", said Nadim Kara, of Partnership Africa Canada. In exchange for progress, Zimbabwe was to have been allowed to export their diamonds, he said. “Within six months, some progress was made on some of those points, but not all of them. (Zimbabwe) thought that when they’d done a little bit, then exports would be allowed," Kara said. What followed was the taking of sides. The countries of the African Diamonds Producers Association showed solidarity with Zimbabwe, feeling that countries like the US, Canada and the UK, who have trade sanctions against Zimbabwe, had an agenda against them, Kara said. Caught in the middle were diamond manufacturing countries such as India, China, the UAE and Israel. The impasse persisted until the KP intersessional meeting in June in Kinshasa, Democratic Republic of Congo. No consensus was reached, but the Congolese Kimberley Process Chair Mathieu Yamba unilaterally cleared Zimbabwe diamonds for export. Participants waited to see whether diamond-processing countries, like India would align themselves with Zimbabwe, which now considers exports to be sanctioned, Kara said. India’s acceptance that the Kimberley Process had not reached a consensus represents a shift in the negotiations. “India could have taken legal cover, but they recognized that KP chair should reflect the will of KP participants, not his country," Kara said. “India deserves a lot of praise right now. They are under pressure from their industry, with one million (in diamond industry) workers and four million dependent workers. There is a lot of sympathy for them," Kara said. Sabyasachi Ray of the GJPEC said that though India doesn’t agree with the position that Zimbabwe’s diamonds should be banned, it is not willing to allow their import until the KP formally approves them. “Until India is fully confident that consensus has been reached, we will not take a stand which may be dubbed as unilateral." Until then, India is not formally choosing a side. “There are producers and consumers. We are in between. We are processors. We are trying our best to bring in consensus between both the groups," Ray said. Chaim Even-Zohar, the Tacy consultant, who represented the diamond industry in last year’s KPCS Zimbabwe Review Mission, sees the issue as threatening the very existence of the Kimberley Process. “Basically, the KPCS finds itself in a moral, political and legal mess—and there are few, if any, governments that have decided to become pro-active to do something about it," said Tracy’s Even-Zohar. “Clearly, India holds a pivotal position also in finding the solution to the imbroglio. India wants the KPCS to survive."